Posted on Sunday, March 15th, 2015 at 8:56 pm. 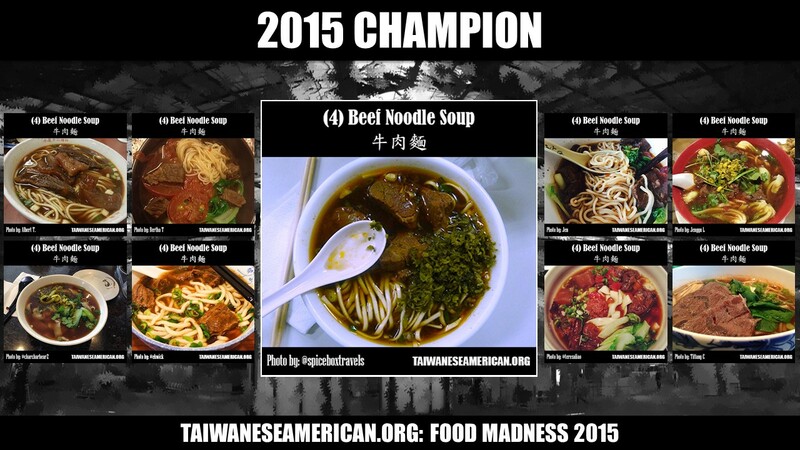 After two weeks of voting, we have found our winner – Beef Noodle Soup (牛肉麵)! Just seeing the sheer number of pictures submitted of Beef Noodle Soup showed that it was going to be a very strong contender. Thank you to everyone for participating, and please let us know what foods we missed / how we can improve upon this for next year! The NCAA March Madness Tournament is under way, and we’re getting into it too, food style. 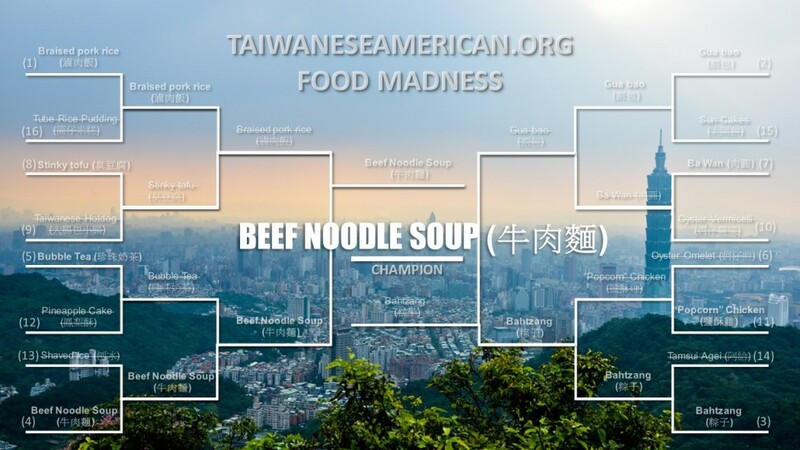 TaiwaneseAmerican.org is proud to present the first annual Taiwanese Food Madness tournament! We’ve selected 16 of the many revered Taiwanese foods, and created a bracket to see which dish/dessert is YOUR favorite! Which one will be voted fan favorite? Did we leave something off the list? Let us know, so we can make an even fuller list next year! Shaved ice v.s. Beef noodle soup bracket is way too brutal imo. BEEF NOODLE SOUP VS SHAVED ICE IN THE FIRST ROUND?????? THE TOURNAMENT COMMITTEE REALLY DROPPED THE BALL ON THIS ONE!!! SHAVED ICE IS SEEDED WAY TOO LOW,,, IT IS THE MICHIGAN STATE OF TAIWANESE FOOD IN MARCH MADNESS FOOD BRACKETS THIS IS UNJUST I CALL FOR A REDO!!!! When will the chart be updated? After each full round? Is it Northern or Southern Bahtzang?